A way of conducting business. Susan Scott trains clients in the art of fierce conversations, empowering them to achieve exceptional results through transforming dialogue. Success hinges on engaging people in ways that interrogate reality, provoke learning, tackle tough challenges, tap our deepest aspirations, and enrich relationships. 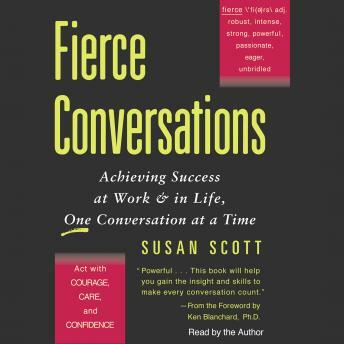 Fierce Conversations takes you step-by-step through your first fierce conversation -- with yourself -- and on to the most challenging and important conversations facing you. Susan Scott teaches you how to: Overcome barriers to meaningful conversation Expand and enrich the territory you explore with colleagues, friends, and family Explore issues by mining for increased clarity, improved understanding, and impetus for change Confront challenges with courage, compassion, and skill Leverage new skills for frictionless debate Handle strong emotions - your own as well as others' Build breakthrough relationships with colleagues, clients, friends, and family Fierce Conversations is the master guidebook to transforming the conversations that are central to your success, offering a new way of relating to people -- at work, and in every area of your life.